Beserat Debebe, the creator of Ethiopia's superhero comic "Jember" and the founder of Etan Comics, brings to life the country's first female superhero comic, "Hawi". The comic tells the tale of a young Ethiopian woman, named Ement Legesse, who has to rescue her mother after she is abducted. Hawi is described as a historical fantasy that is set in modern-day Ethiopia and draws from the mysteries of the kingdoms and queendoms of Ethiopia's rich past. Created by Etan Comic's founder Beserat Debebe and a host of talented African illustrators, the comic's visuals depict the vivacious past and present of Ethiopia while creating a singular comicverse. 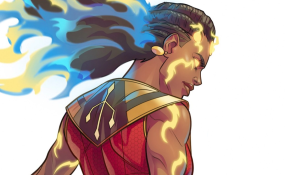 In its reflection of the past, the comic features one of Ethiopia's most prolific women, Queen Yodit Gudit, a 10th-century ruler whose Amharic nickname, Esato, means "fire". She is remembered for her fiery spirit and reputation for burning down architectural landmarks, including churches, following her great conquests. Her legacy has unfortunately been eroded over time and her inclusion in this modern tale is a demonstration that greatness can never truly be forgotten. Business Insider called Hawi "a story about returning to one's roots and having the courage to rise above the challenges that come with seeking reconciliation and belonging. It's one we can all relate to, whether literally or figuratively." Debebe told OkayAfrica, "The fact that Hawi is Ethiopian means a lot to me." For him, having an Ethiopian superhero is meant to normalise the idea that Ethiopians and Africans in general can have an impact on the world. "I wish I had seen an Ethiopian superhero growing up," he said. "I would have embraced my ability to make a difference earlier and acted on it... Most of the time, the way we think about ourselves is the main barrier to our own progress." Debebe went on to explain that his biggest hope is for all of his superhero characters to take away these barriers and allow boundless imagination among the African youth. "And have as much fun as possible doing it!" he adds.